The White House has suggested that President-elect Donald Trump’s campaign benefited from alleged Russian hacking. “The last several weeks so the election were focused on a discussion of emails that had been hacked and leaked by the Russians. 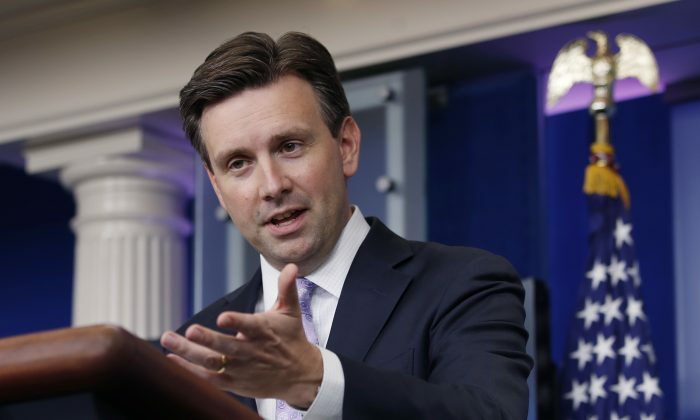 These were emails from the (Democratic National Committee) and John Podesta, not from the (Republican National Committee) and Stephen Bannon,” Earnest said, apparently referring to WikiLeaks dumps. However, WikiLeaks founder Julian Assange has insisted that Russia wasn’t the source of the emails. “The Clinton camp has been able to project a neo-McCarthyist hysteria that Russia is responsible for everything. Hillary Clinton has stated multiple times, falsely, that 17 U.S. intelligence agencies had assessed that Russia was the source of our publications,” Assange said, according to an interview broadcast on Russian state TV in November. Trump, meanwhile, has dismissed a CIA report claiming Russians intervened in the U.S. election. Senate Majority Leader Mitch McConnell, R-Ky., on Monday said the Senate Intelligence Committee and the Senate Armed Services Committee will carry out bipartisan reviews of the case. “Obviously, any foreign breach of our cybersecurity measures is disturbing and I strongly condemn any such efforts,” McConnell said in a statement, USA Today reported. Senate Minority Leader Chuck Schumer (D-N.Y.), Armed Services Chairman John McCain (R-Ariz.), and Intelligence Chairman Richard Burr (R-N.C.), also raised the issue—sentiments with which McConnell agreed. House Speaker Paul Ryan (R-Wis.) said the House Intelligence Committee will look into the matter, but stopped short of announcing an investigation.